Kerry MacPhee, Harriet Harnden, Charlie Aldridge and Martin Fanger took the honours at round two of the HSBC UK | National Cross-Country Series at the iconic Hadleigh Park, host venue of the 2012 Olympic MTB race. On a course that incorporated around 90 per cent of the 2012 version and many of its key features, the racing demanded a high level of both physical and technical ability. Kerry MacPhee led a fast-starting bunch off the line, carrying French challenger Marie Dufosse away from the elite field for a small lead by the end of lap one. As early as halfway round lap two the leading junior Harriet Harnden (T-Mo racing) had already ridden through the entire elite field having started a minute behind them, a dominant performance that saw her hold on for a comfortable win ahead of round one winner Anna McGorum (Peebles CC) and RST Race Division’s Josie Nelson, a short distance back in third. 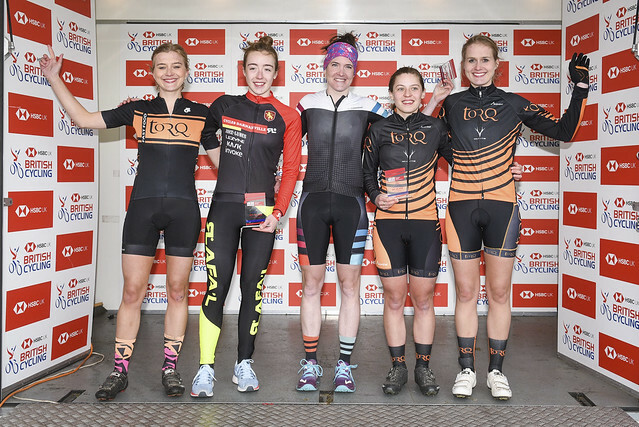 MacPhee extended her lead in the elite race to 47 seconds by mid-race and held on for a comfortable win, her first in a national series event, by more than double that duration at the line. Dufosse consolidated a safe and solid second place ahead of Amy-Jo Hansford (Torque Performance), rounding off the podium and moving into the overall Series lead. Round one winner Charlie Aldridge (Stirling Bike Club) got the most impressive start of the day, opening a significant gap having barely completed the start loop. The Elite race featured no less than 16 international riders on the start line and the group of five riders opening a first lap lead featured three of them, Kevin Panhuyzen, Josh Dubau and Martin Fanger. They were joined by UK National Champion Grant Ferguson (Hope Factory Racing) and Frazer Clacherty (Team Inspired), the group quickly opening a 20-second lead at the front of the race. The five leaders worked well together initially, extending the lead to over 40 seconds after two laps, ahead of a fractured chasing pack led by Chris Rothwell (BW Cycles). A series of aggressive laps saw first Clacherty then Dubau distanced by mid race then Ferguson attacked on the back of the course and pulled the Swiss Fanger away with him, helped by a broken chain mechanical for the Belgian Panhuyzen which forced a gap which also put Dubau and Clacherty back into podium contention. On the final lap, Fanger appeared solo on the Rock Garden, descending with a gap of around 20 seconds which he held to the line for an impressive win. "I felt quite good in the front group of riders and I knew my endurance was good so I stayed cool," revealed Fanger.